In 1986, the TVR 420SE sports car was introduced, and powered by the 4228 cc, Rover EFI V8 engine, which developed 300 bhp at 5500 rpm, and 290 ft/lbs of torque at 4500 rpm. In essence, this model was using the 4.2 litre V8 engine as a test bed for the more aggressive 420SEAC variant which, amongst other modifications, used much wilder camshafts. By 1987, when production ended, only 7 units of this variant were built. 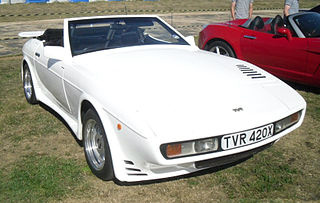 In 1986, the TVR 420SEAC was launched, and was regarded as the pinnacle of the wedge shaped TVR. In fact, it represented the final chapter in the wedge design concept. It was powered by the same engine as used in the 420SE, and had identical power output, but more impressive performance. The symbol "SEAC" referred to the fact that this variant had a Special Equipment Aramid Composite body structure, which meant that at least 20 % of the body consisted of highly advanced kevlar and 80% fibreglass, unlike all other wedges that were 100% fibreglass. As a result of production difficulties with this high tech composition, only the first 8 to 10 units consisted of 100% kevlar bodies, the remaining units having only a 20% kevlar content. The purpose of the kevlar was to act as a reinforcement material which meant that, in the case of the 420SEAC, the body weight was reduced by over 200 pounds without its rigidity being compromised. This weight saving had a profound effect on its performance such that, compared with the 420SE, the top speed increased to 165 mph, and the 0-60 mph time was reduced to 4.7 secs. Furthermore, the use of kevlar in the 420SEAC represented a world first for a production road car. The downside of such a composite structure was that this variant sold for twice as much as a standard 350i. In terms of external appearance, the 420SEAC was distinguishable by its large rear spoiler, and the rounded nose section. This variant was 7 inches shorter and 2 inches wider than the 390SE, and sported a huge "tea tray" spoiler at the rear to keep that end down at high speed. In 1988, when production ended, a total of 37 units had been built, of which 19 were produced in this final year. That same year, it was replaced by the 4.5 litre, V8 engined 450SEAC, which became the premier SEAC variant. Production of this variant ended in 1990, with only 18 units having been built. Many regard the 400-Series as not only the best looking of the wedge shaped cars, but also the best for build quality. A 1986-87 TVR 420SE in good condition should fetch in the region of £12,000/$19,000 to £15,000/$24,000. On the other hand, a 1986-88 TVR 420SEAC racer in very good condition would command around £18,000/$30.000.